Ok, let me just set things straight from the beginning. I have been abandoning my kitchen lately and traded my love for cooking for study. My first break from the books came yesterday and things went OFF in my kitchen! These tarts are AMAZING (I don’t mean to brag but they really are). I have been constantly stocking my pantry with loads of healthy ingredients since moving house but was yet to get creative. So this was it! 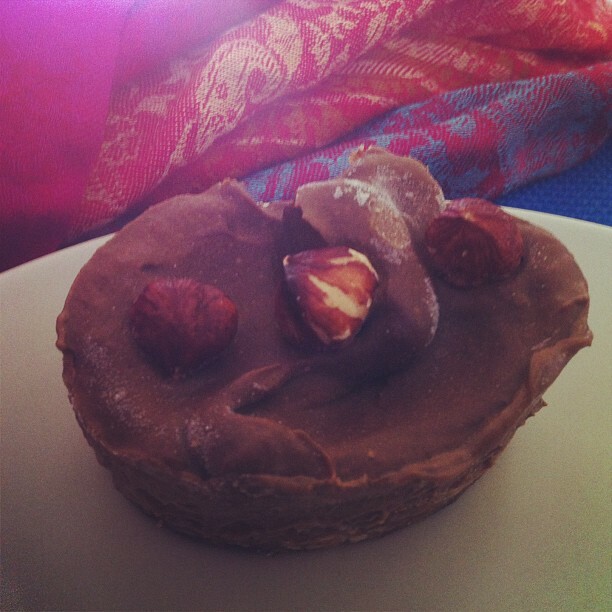 Think crunchy macadamia/almond base topped with chocolate + banana ice-cream with a crunch of hazelnuts on top. That’s the best I could do to paint a picture for you of how super good these are! Enjoy!! In a processor combine almonds and macadamias. Blend until crumbly. Add dates one at a time through the feeder tube. Once well blended and sticky, press 1 tablespoon of the mixture firmly into a muffin pan. In a small processor or stick mixer add banana, avocado, coconut oil, cinnamon, vanilla, maple syrup and cacao powder. Blend til smooth and creamy. Top the nut bases with the chocolate mixture. Sprinkle with hazelnuts and place in the freezer until set.